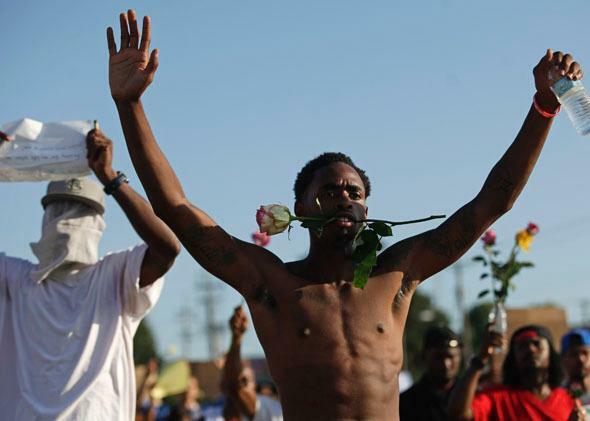 “Sidewalk counselors” in Ferguson, Missouri, on Aug. 19, 2014. Kyle Niere, 23, was arrested on Monday night in Ferguson, Missouri, for “refusing to disperse” as he attempted to leave the QuikTrip station, where hundreds have gathered to protest the police shooting of Michael Brown, an unarmed black teen. As he later relayed to NBC News, Niere, along with 12 other protesters, was arrested after cops told him and his friends that they “looked like the type that were going to stir up drama and go start looting.” According to Niere, police officers dragged him “face-first on the ground” and were “stepping on the back of our heads.” Niere and the others were held overnight and released. This has been the pattern for more than a week: Dozens of legitimate protesters arrested for essentially doing it wrong, which can be variously described as protesting about issues of race, refusing to stop protesting about issues of race, and in many cases, perhaps most outrageously, protesting while black. You might be asking yourself: Why do these things matter? Both protesters and counselors are assembling to express a message about which they feel strongly. That’s cute. The critical thing about being a free speech protected “counselor” instead of a less free speech-protected “protester,” you see, is that the court recognizes that as a counselor, you have important information that you need to deliver to your audience and apparently some kind of magic inherent wisdom that your audience would benefit from hearing. A protester, on the other hand, can be pushed back from his desired location or corralled into a “free speech zone.” Presumably this is because what protesters have to say is less urgent or informed. As described by Justice Samuel Alito in his McCullen concurrence, “counselors” are even better read than the women they counsel. A counselor, thus, can’t be banished to a remote island location because that really gets in the way of all that important counseling. Follow? We don’t either. Which brings us to 90-year-old Hedy Epstein, a Holocaust survivor arrested this week in St. Louis for “failing to disperse.” In the past week, there have been dozens of others arrested in Ferguson for this same form of protest—for being outside after the state-imposed curfew, or marching up and down a public street instead of staying in the designated “approved assembly area,” or gathering instead of continuing to march when the cops ordered them to keep moving. On the face of it, Hedy Epstein looks an awful lot like Eleanor McCullen, the “gentle sidewalk counselor” whose desire to teach and leaflet and persuade her fellow citizens was granted so much solicitude by the court in the case that bears her name. Like McCullen, Epstein had an explicit political message to impart: She wants National Guard troops out of Ferguson and a special prosecutor appointed to investigate the killing of Michael Brown. It’s hard to credit this message as less important, less informed or informative, or less urgent than McCullen’s. And Epstein’s crime, failing to disperse, is precisely the behavior granted First Amendment protection in McCullen. It is impossible to see the two types of protest (or counseling) as fundamentally different, except for the fact that the court now says it does. The fear is that race plays a critical role in one arena and not in the other. Perhaps the difference between “counseling” and protesting ultimately just comes down to religion, which would be extremely problematic for constitutional purposes. Maybe it’s no coincidence that the calming of the police crackdown the last few nights coincides with more and more demonstrations in Ferguson being organized by faith groups and being openly religious in tenor. But if we afford religious protest (and the act of protesting with rosaries) more freedom than secular protest on the streets of Missouri, we have a different First Amendment problem. To be sure, opponents of the Ferguson protests will say that once the protesting is conflated with looting, it’s fine for the police to step in. But it can’t possibly be the case that the Massachusetts abortion law—enacted after actual killings happened at abortion clinics—is less necessary than the squelching of looters. And even if you concede that some of the looters are indeed dangerous, the bulk of the protesters are no more looters than the bulk of abortion protesters are murderers. Reasonable minds can and have differed on whether the court’s decision in McCullen was correct (in fact, the two of us view McCullen quite differently). But there is surely agreement that the same rules need to apply to all protest regardless of who is speaking and what is being said. The court in McCullen told a story about a kind-hearted grandmother and then proceeded to craft a rule that fit her. They even allowed that rule to expand to the other speakers—including the mean, loud aggressive ones—because the buffer zone was unconstitutional for all. In Ferguson, however, the story being told has a very different focus. There the attention is on the troublemakers and everyone else is getting swallowed up in their shadow. Justice Felix Frankfurter once wrote, “It is true … of a journey in the law that the place you reach depends on the direction you are taking. And so where one comes out on a case depends on where one goes in.” As we become a country that is ever more inclined to arrest, detain, pepper spray, and shoot its protesters, the rest of us should seriously contemplate becoming a nation of “sidewalk counselors” to stop this trajectory. Maybe all you need to do is say, “Good morning,” hold out a leaflet, and you won’t get tear-gassed.